Calling all Tall Ships America members! You can help sail EAGLE across the Atlantic Ocean! The ship will depart Baltimore, MD on or about 08 April and arrive Portsmouth, England on or about 27 April. Volunteers have the option to depart in England or sail on and help provide ship tours in Oslo, Norway and Kiel, Germany. If you decide to stay on to help with tours, you will depart EAGLE no later than 11 May from Kiel, Germany. Berthing is free. Volunteers must pay for own transportation to/from ship and meals. EAGLE seeks able-bodied mariners between 18 – 50 years old who will, when underway, work the rig, stand 8 hours/ day of watch tending sails and/or helm/lookout, and provide 1 day/week of messcook or scullery service. If assisting in port as well, they seek mariners who can help provide up to 10 hrs/day of “tour duty” every 3rd day. EAGLE is the sail-training vessel for the US Coast Guard Academy. The ship’s displacement is 1800 long tons. She is propelled with 23 sails and a dual turbo motor turbine unit engine capable of 1,200 HP. Please submit an application to Erin Short by January 31st according to the criteria and instructions below. You will be notified of your acceptance by February 8th. 1. )You must be at least 18 years old and not more than 50 years old. 2.) You must be fit, willing and able to work aloft. You must pass a medical clearance. 3.) You must be a U.S. Citizen. 4.) You will be full a participant in the operation of the ship: standing watch, helm, lookout, bridge, maintenance, working aloft, galley and all other regular trainee duties. 5.) You are welcome and STRONGLY ENCOURAGED to attend training classes with the USCG crew. 6.) The ideal candidate is an experienced, rising sail training practitioner. This program is not for “Old Salts”, and it is not for first-timers. 7.) Upon successful completion of the program, EAGLE will issue to you (if you request it) a letter of Sea Service or other formal documentation of your sea service in EAGLE. 8.) Participants must pay $12/day for food and expenses, etc. Total cost of food for 21 days will be approximately $250. 9.) 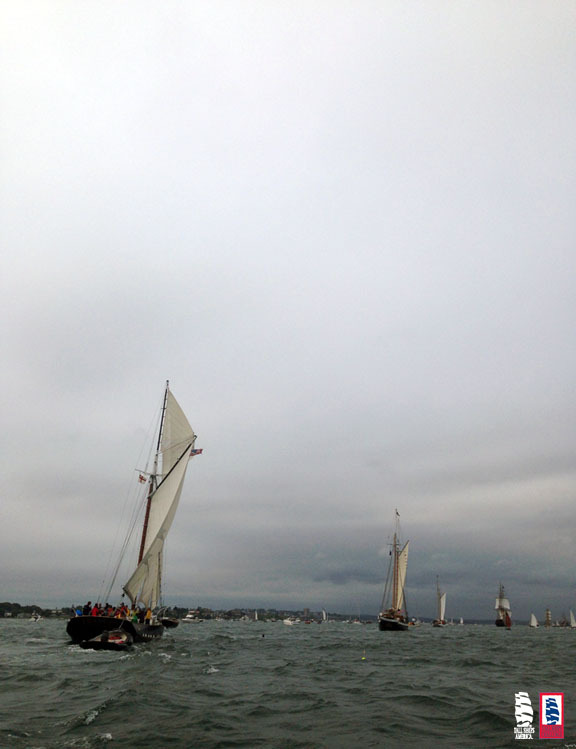 Participants will write a post voyage blog post and share pictures with Tall Ships America to share with their members. 2.) You must be a Tall Ships America member in good standing to apply. Not a member? Become one now! c.) Welcome packet with Waiver of Liability and Indemnity Agreement and Guest Medical Forms will be provided to accepted applicants by mid-February. 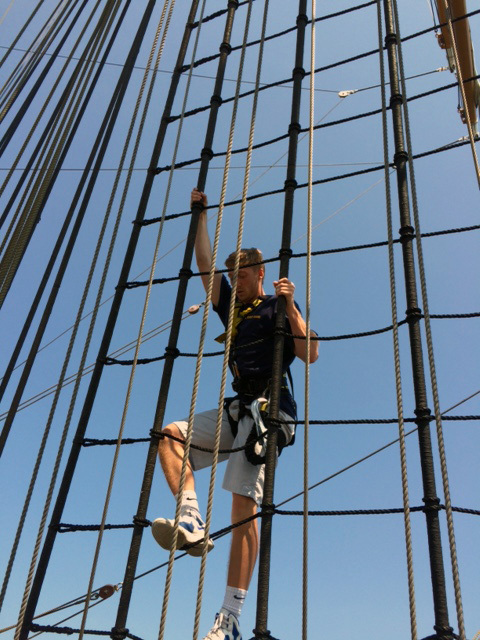 This opportunity is available to you based on the mutual regard and respect that is shared between the EAGLE leadership and Tall Ships America, and in support of our shared mission in promoting leadership training under sail. This is truly a rare and special opportunity, and we are very happy to be able make it available to you, the up-and-coming next generation of sail training officers and crew. 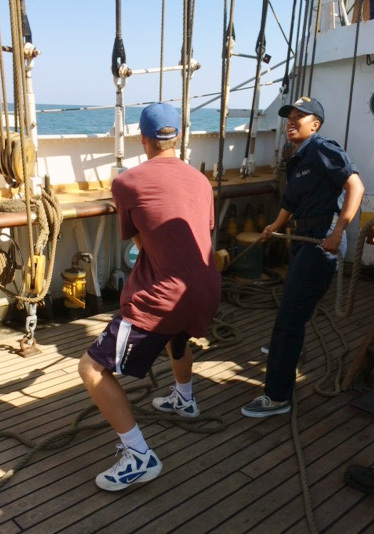 Enjoy the unique opportunity for Tall Ships America Members to advance their professional training, qualifications, skills, and credentials in a sail training program aboard America’s Tall Ship. Restrictions apply. Applicants will be accepted on a first come, first served basis. Experienced tall ships sailors are invited to join the ship on a voyage 23 September to 04 October. During this run, sailors will join Coast Guard crew and officer trainees. Participants will embark on Saturday, September 22nd, at the Coast Guard Yard in Baltimore, MD. EAGLE will sail out of the Chesapeak Bay into the Atlantic for some off-shore sailing. EAGLE will sail back to Baltimore for arrival on Thursday, October 4th. These opportunities are open to new applicants only. Applicants must be current Tall Ships America members between 18 and 50 years of age and should be experienced mariners interested in professional development. Be advised that berthing is in the trainee accommodations. This experience will be a great resume-enhancer and tonnage-time booster! Applications must be received no later than 2 July at 1700 EDT. See below for program and application details. 4.) You will be full a participant, along with the USCG trainees, in the operation of the ship: standing watch, helm, lookout, bridge, maintenance, working aloft, galley and all other regular trainee duties. 5.) 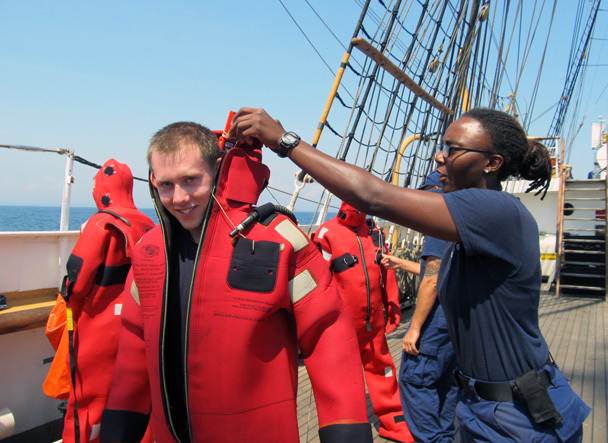 You are welcome and STRONGLY ENCOURAGED to attend training classes with the USCG trainees. 8.) Participants must pay $12/day for food and expenses, etc. 1.) All applications must be submitted electronically to Tall Ships America at erin@tallshipsamerica.org. This opportunity is available to you based on the mutual regard and respect that is shared between the EAGLE leadership and Tall Ships America, and in support of our shared mission in promoting leadership training under sail. This is truly a rare and special opportunity, and we are very happy to be able make it available to you, the up-and-coming next generation of sail training officers and crew. We expect that all participants in this program will work hard and do their best to uphold the excellent relations that exist between EAGLE and the civilian sail training community, and in all ways observe and respect the policies, procedures, and rules of comportment as established aboard EAGLE. It’s funny. It doesn’t matter how many ports we have lined up for the summer, it always feels like it went by way too fast. This summer was no exception. Just last month, we welcomed a fleet of ships to Charleston and it was only last week that we waved goodbye from Boston. In between, I had the opportunity to spend a week in Bermuda and next month, Darlene and I are road-tripping our way to Quebec City for the final send off before the ships sail back to Europe as part of the Rendez-vous 2017 Tall Ships® Regatta. Sail on EAGLE this summer! Two opportunities to sail aboard EAGLE this summer! 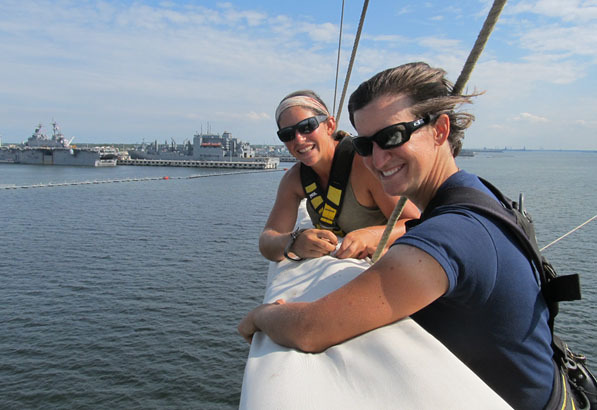 Enjoy two unique opportunities for Tall Ships America Members to advance their professional training, qualifications, skills, and credentials in a sail training program aboard America’s Tall Ship. Restrictions apply. Applicants will be accepted on a first come, first served basis. 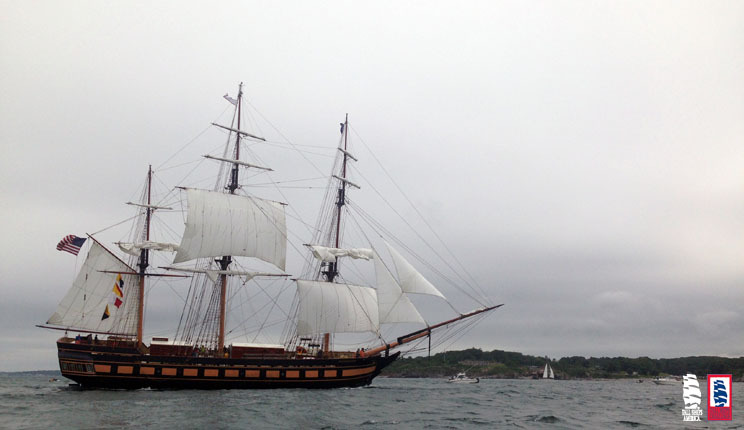 Experienced tall ships sailors are invited to join the ship on a voyage 07 – 18 August. Sail on EAGLE this September! Enjoy a unique opportunity for Tall Ships America Members to advance their professional training, qualifications, skills, and credentials in a sail training program aboard America’s Tall Ship. Experienced tall ships sailors are invited to join Captain Meilstrup and Coast Guard Officer Candidates on a voyage September 3rd to 17th. Restrictions apply. Applicants will be accepted on a first come, first served basis. During this run, sailors will join Coast Guard crew and officer trainees. Participants will embark on Saturday, September 3rd, in Baltimore, MD. EAGLE will moor in Charleston, SC on Friday, September 9th. EAGLE will depart Charleston on Monday, September 12th and sail back to Baltimore for arrival on Saturday, September 17th. This opportunity is open to new applicants only. Applicants must be current Tall Ships America members between 18 and 50 years of age and should be experienced mariners interested in professional development. Be advised that berthing is in the trainee accommodations. This experience will be a great resume-enhancer and tonnage-time booster! Applications must be received no later than 15 August at 1700 EDT. 7.) Upon successful completion of the program, EAGLE will issue to you (if you request it) a letter of Sea Service or other formal documentation of your sea service in EAGLE. 8.) Participants must pay $12/day for food and expenses, etc. d.) Completed Guest Medical Forms. NOTE: This requires a consultation with a doctor. It’s been bonkers here at Tall Ships America HQ. The weather has finally (finally!) started to feel like Spring, which means that the TALL SHIPS CHALLENGE® Great Lakes 2016 Race Series is just around the corner. Our summer interns have been hired and I am excited to share their stories with you later this week. 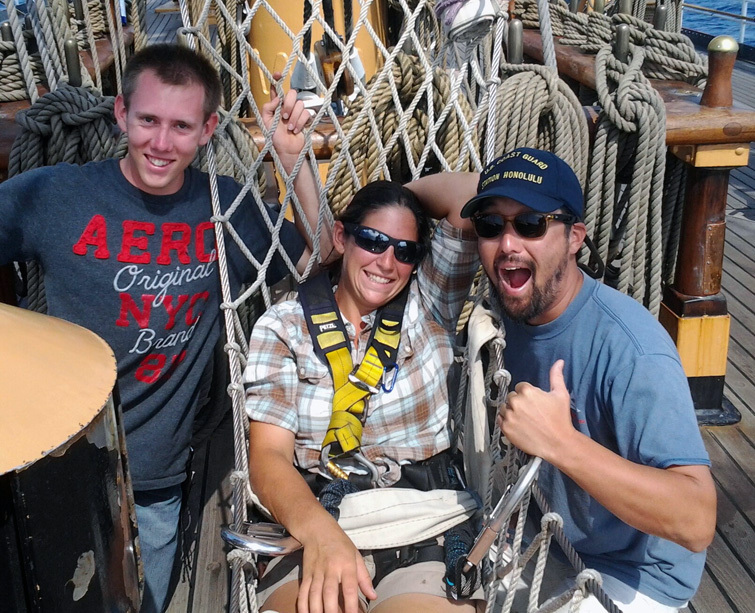 And, to top it all off, I celebrated my ten year anniversary at Tall Ships America last month. Mind=Blown. You can read about my five year anniversary here and I have a post to share next week. Experienced tall ships sailors are invited to join Captain Meilstrup and Coast Guard Officer Candidates on a voyage March 8th-26th . Restrictions apply. Applicants will be accepted on a first come, first served basis. During this run, sailors will join Coast Guard crew and officer trainees. Participants will embark on Tuesday, March 8th, in Baltimore, MD. EAGLE will have a short port call in Little Creek before mooring in Savannah, GA on Wednesday, March 16th. EAGLE will depart Savannah on Saturday, March 19th and sail back to Baltimore for arrival on Saturday, March 26th. Please note, the leg from Baltimore to Little Creek will be motoring ONLY. This opportunity is open to new applicants only. Applicants must be current Tall Ships America members between 18 and 50 years of age and should be experienced mariners interested in professional development. Be advised that berthing is in the trainee accommodations and participant berths will be available from Monday, March 7th through midday on Sunday, march 27th. This experience will be a great resume-enhancer and tonnage-time booster! Applications must be received no later than 1 March at 1700 EST. Lunch tray in hand, walking down the wide companionway from the galley to the mess deck of the 295′ barque Eagle, to find an open seat in a sea of a hundred matching navy blue uniforms and two hundred polished black composite toed boots is somewhat surreal. On my last tall ship, our motley crew of twelve or so squeeze through a tiny galley in our torn up, paint and pine tar covered Carhartts, grab our plates and personalized coffee mugs, then scatter around on deck. There are a few points of culture shock going on here: one is the sheer scale of things, the other is being a civilian on a military training vessel. 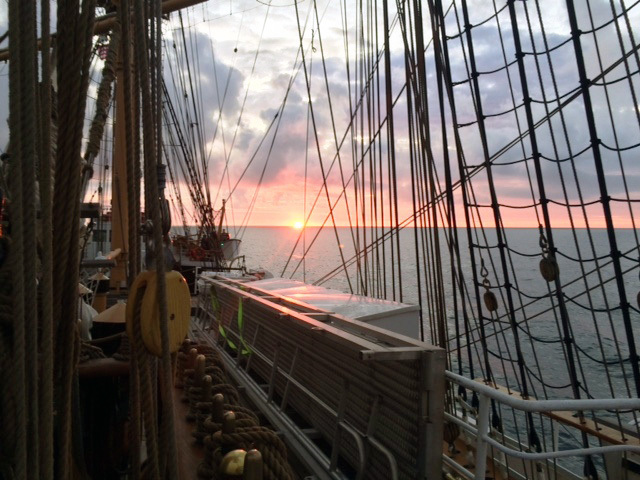 Last month, Tall Ships America invited current members to apply for the opportunity to sail on board USCG Barque EAGLE as part of their twice-yearly Officer Candidate School (OCS) cruise. This collaboration with EAGLE has been going on for several years . I wrote about my own experience on EAGLE during the March 2011 OCS cruise and I am always excited to see who applies and then seeing their photos on Facebook. 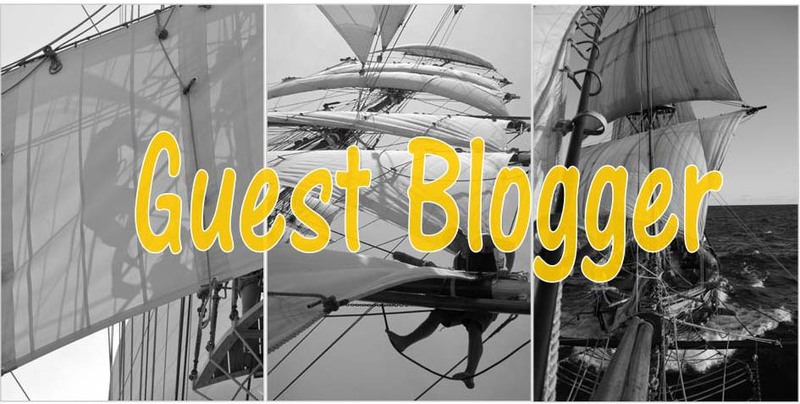 Occasionally, I even get some sailors to write about their experience on this blog- read Lance Fairbanks and Brian Holmen’s posts. The spring OCS training run is usually in March and we hope to be able to offer this opportunity to our Tall Ships America members again (not a member? Become one now!). We will make the announcement with the requirements via this blog, Twitter and Facebook.